Powered by the Zeo Crystal! Actual-size replica of the Zeo Gold Ranger's morpher and weapon. Straight out of the Power Rangers Zeo TV series. Features show-accurate lights and sounds, plus premium die-cast parts! Straight out of the Power Rangers Zeo TV series, this Power Rangers Legacy Zeo Golden Power Staff Prop Replica is an actual-size reproduction of the legendary Zeo Gold Ranger's morpher and weapon! 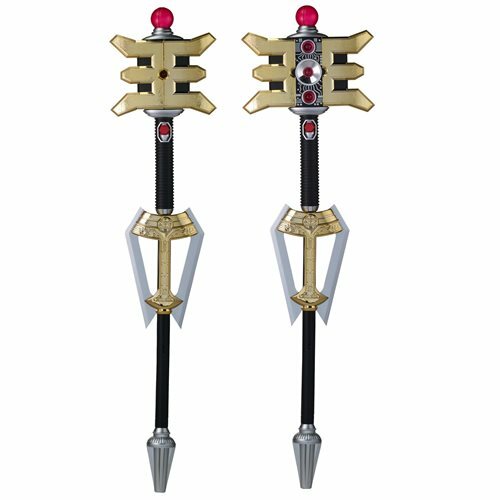 With show-accurate lights and sounds, plus premium die-cast parts, the Legacy Golden Power Staff is perfect for cosplay or display. Made of quality die-cast metal and plastic, it requires 2x "AAA" batteries, included. Ages 15 and up.